Joomla backup is a concern for users of this CMS. Along with traditional methods and unautomated Joomla backup plugin services, the Handy Backup that allows automatic, easy-to-use Joomla database backup and restore. Let us show how you can make a copy of your Joomla site with Handy Backup! Handy Backup makes Joomla backup database with a dedicated "MySQL" plugin, making copies of Joomla data from a local or remote database. This plugin is extremely simple for setup, as well as absolutely reliable. You can use it not only for Joomla but also for "conventional" MySQL backup! 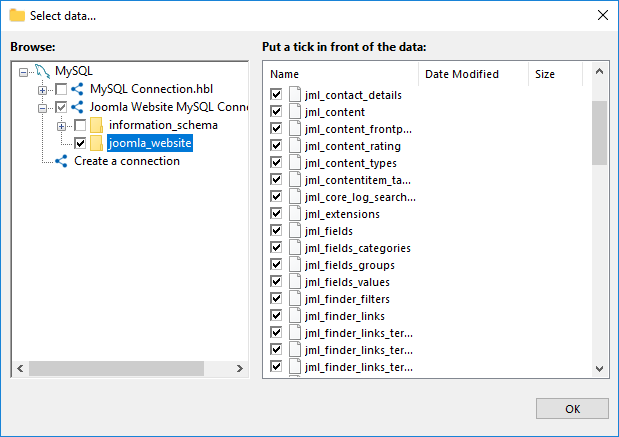 The Joomla backup plugin saves a "dump" copy of a website-related database as a sequence of MySQL commands in a text file. Therefore, you can browse for website content from unencrypted backup, run it to restore website tables manually, change MyISAM storage engine to InnoDB or vice versa, and so on! Schedule your Joomla backup tool to make a copy at an exact time and with an interval from a minute to several months. Create incremental and differential backups to save time and storage place. Make "hot" backups without stopping a site, or stop it for "cold" backup. Encrypt and compress. Do what you need!. When you want to restore Joomla site from backup, just create a recovery task and set up the parameters using the same simple graphical interface as for backup Joomla website. You can even clone your Joomla backup image to other host in automatic mode (for mirroring, replicating etc.). The Small Server solution allows making Joomla website backup and recovery just out of the box. Free 30-days trial version! How to Backup Joomla Website Using Handy Backup? This is quite simple action, due to the graphical interface and the step-by-step task creation wizard. Please follow the next instruction to make automatic Joomla backup easily. 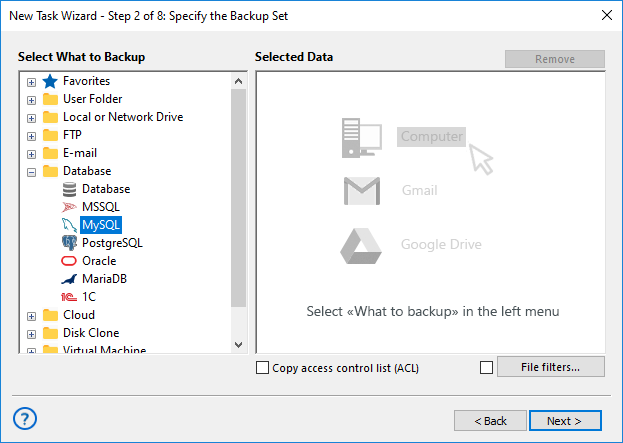 In Handy Backup, create a new backup task by Ctrl+N keys or by a button on the main panel. On the Step 2, select the "MySQL" feature in the "Database" group. In the new window, double-click onto the "Create a connection" string. Enter the parameters (server name or IP, username and password) to connect to Joomla. Click OK. Mark checkboxes against tables related to your website to add to Joomla backup. Again, click OK and return to the Step 2 window. Proceed as described in the User Manual. An advice: You may also backup static Joomla data by using one of "FTP", "SFTP" or "FTPS" plug-ins to save the static website content. You can set up this in the same or different task, as you feel convenient. How to Restore Joomla Site from Backup? This is another simple task to make and run. Make a new restore task on the Step 1 of a task creation wizard. On the Step 2, select your storage with a Joomla backup, and open it. 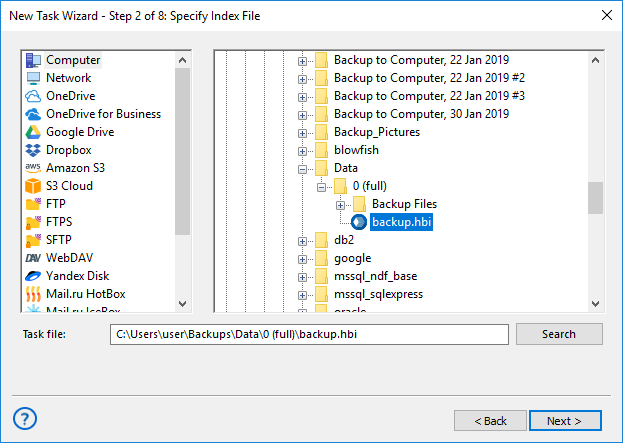 Find a file backup.hbi in the folder with Joomla website backup, and select it. Click "Next". Click the "Change location" button to do it. Select a new connection with a different MySQL database. 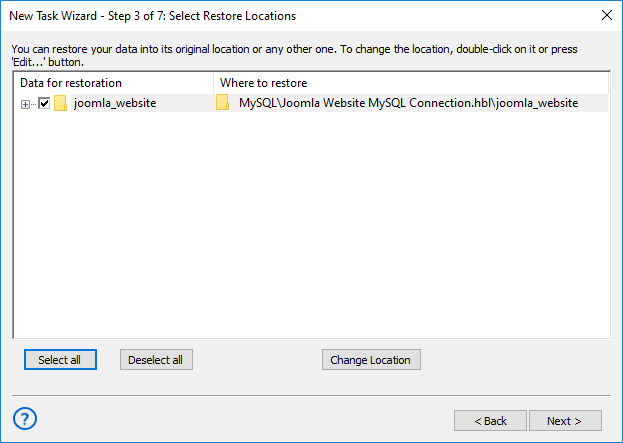 In a new window, select where to restore a Joomla copy from backup. Click OK and continue creating a task, according to the User Manual. 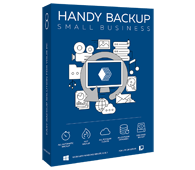 Experience the might of Handy Backup for making Joomla backup and restore tasks! Try it now by downloading a 30-day trial edition with full set of options and plug-ins!